contain their information regarding the document generally in non-rastered form, as vector graphics. In order to print a document, it must be rastered sooner or later, meaning a conversion from a vector graphic into matrix graphic. In contrast, Image file formats like *.tif are already present as rastered matrix graphics. If the document is not being directly and immediately rastered by the operating system´s graphics engine (GDI), as EXTIF pro does, but translated in PostScript and/or in PDF before finally being rastered, then inevitably the final version will be a distorted picture of the original. For example, a text being translated from German into Spanish, via a translation into Russian, looses definition and the true meaning due to the intermediate steps. By using several steps, the situation cannot improve, and infact become increasingly distorted. When you print the original document www.DriverLab.de/EXTIFpro/TestDocums/HorzShift.doc, (the beige screenshot in the image below) with resolution “600 dpi Extremely Smoothed" using EXTIF pro, you obtain the result displayed in the green background field in the below image. The 4 red vertical auxiliary lines are meant to mark the outermost right hand side extension of these 4 lines. 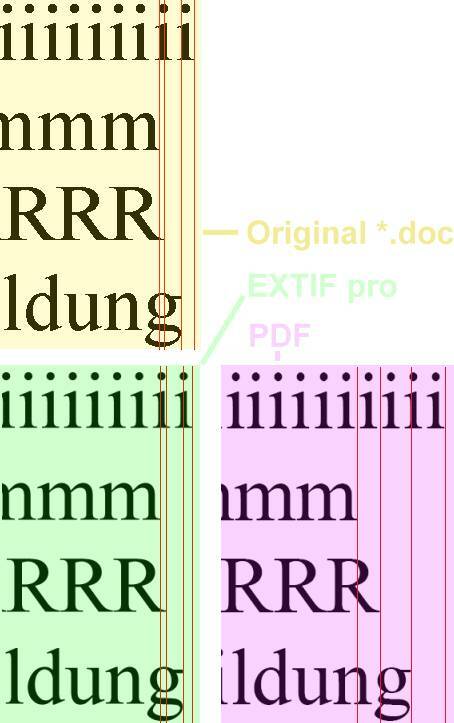 Comparing the relative position of those lines, you will notice that all the proportions of corresponding document “HorzSchrift.pdf” (see purple background field below) are displaced, while corresponding image “HorzSchrift.pdf” in green background field reflects the original image with high fidelity. The chosen example may seem theoretical and non-practical, as in daily practice real text lines don’t usually consist of the same recurrent letter; consequently the observed geometrical displacements on typesetting are reduced by the average. However the example disproves in a striking manner the general and common opinion that PostScript / PDF would provide a perfect and exact 1:1 copy of the original. The desired snapshot or screenshot of the original document onto an abstract internal canvas can only be provided by a Software-RIP (Raster Image Processor) like EXTIF pro, as a real Screenshot (Ctrl + Print Screen) does not capture anything else but the image of the original document rastered onto the monitors screen by the very same Windows graphics engine (GDI). It is for a reason that printer drivers and screen drivers form a common class within the architecture of the Windows operating system. Printers and screens just like scanners and plotters belong to the same class of raster devices. Whoever really wants to offer his customers the quality advantage of the highly-praised WYSIWYG (“What You See Is What You Get” - here meaning that the customer gets in the end, on the printed paper, exactly the same image that he saw on his screen when creating the original document) must raster the original document the right away, in the exact way that EXTIF pro does, instead of using intermediary formats, as in the case of PostScript or PDF. 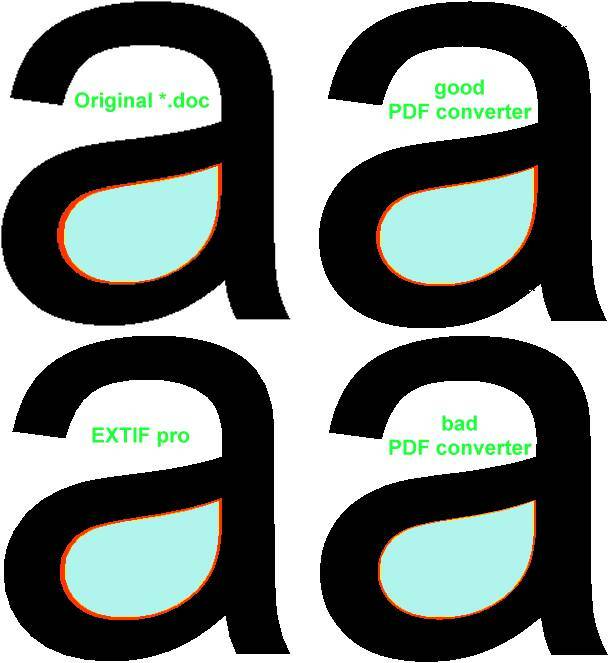 As you can already see with bare eye, the inner surfaces are being slightly narrowed in the case of both PDF converters – much more obvious in the case of the bad converter – which, whether consciously or not, distorts the optical impression.